Two flaring objects in two different galaxies may represent an entirely new phenomenon. These objects brighten in X-rays by a factor of 100 in about a minute before returning to previous level in about an hour. There are several important differences between these objects and magnetars, which are also known to flare rapidly in X-rays. Astronomers used data from both Chandra and XMM-Newton to make this discovery. This image shows the location of a remarkable source that dramatically flares in X-rays unlike any ever seen. Along with another similar source found in a different galaxy, these objects may represent an entirely new phenomenon, as reported in our latest press release. These two objects were both found in elliptical galaxies, NGC 5128 (also known as Centaurus A) shown here and NGC 4636. 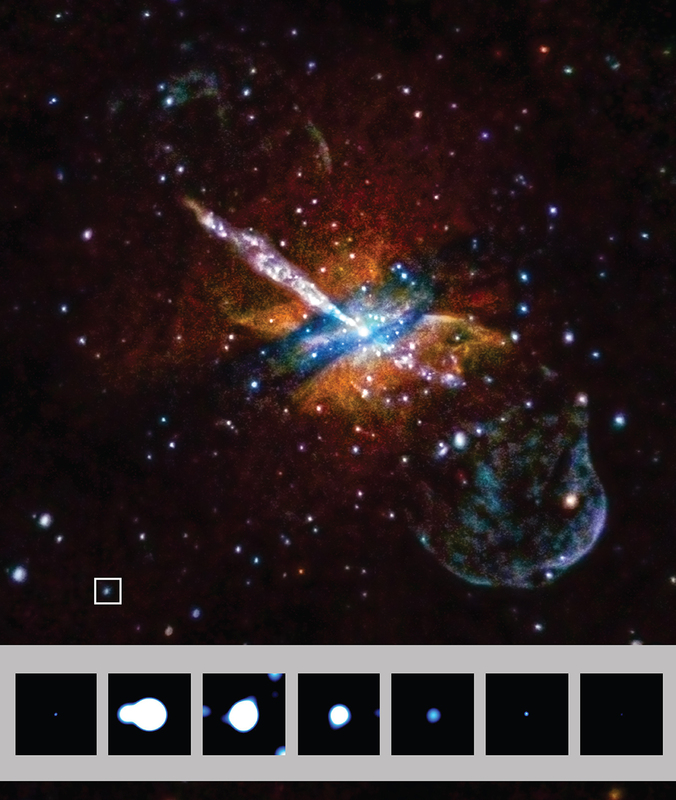 In this Chandra X-ray Observatory image of NGC 5128, low, medium, and high-energy X-rays are colored red, green, and blue, and the location of the flaring source is outlined in the box to the lower left. Both of these mysterious sources flare dramatically - becoming a hundred times brighter in X-rays in about a minute before steadily returning to their original X-ray levels about an hour later. At their X-ray peak, these objects qualify as ultraluminous X-ray sources (ULXs) that give off hundreds to thousands of times more X-rays than typical X-ray binary systems where a star is orbiting a black hole or neutron star. Five flares were detected from the source located near NGC 5128, which is at a distance of about 12 million light years from Earth. A movie showing the average change in X-rays for the three flares with the most complete Chandra data, covering both the rise and fall, is shown in the inset. The source associated with the elliptical galaxy NGC 4636, which is located about 47 million light years away, was observed to flare once. The only other objects known to have such rapid, bright, repeated flares involve young neutron stars such as magnetars, which have extremely powerful magnetic fields. However, these newly flaring sources are found in populations of much older stars. Unlike magnetars, the new flaring sources are likely located in dense stellar environments, one in a globular cluster and the other in a small, compact galaxy. When they are not flaring, these newly discovered sources appear to be normal binary systems where a black hole or neutron star is pulling material from a companion star similar to the Sun. This indicates that the flares do not significantly disrupt the binary system. While the nature of these flares is unknown, the team has begun to search for answers. One idea is that the flares represent episodes when matter pulled away from a companion star falls rapidly onto a black hole or neutron star. This could happen when the companion makes its closest approach to the compact object in an eccentric orbit. Another explanation could involve matter falling onto an intermediate-mass black hole, with a mass of about 800 times that of the Sun for one source and 80 times that of the Sun for the other. This result is describing in a paper appearing in the journal Nature on October 20, 2016. The authors are Jimmy Irwin (University of Alabama), Peter Maksym (Harvard-Smithsonian Center for Astrophysics), Gregory Sivakoff (University of Alberta), Aaron Romanowsky (San Jose State University), Dacheng Lin (University of New Hampshire), Tyler Speegle, Ian Prado, David Mildebrath (University of Alabama), Jay Strader (Michigan State University), Jifeng Lui (Chinese Academy of Sciences), and Jon Miller (University of Michigan). Coordinates (J2000) RA 13h 25m 52.7s | Dec -43° 05' 46.00"
It is possible, that those ultra luminous flares could be produced by falling a huge compact body, like a big planet and or a brown dwarf orbitting the star, onto the black hole. In an accreating binary system, atmospheric waves sloshing about the source star could modulate the rate of mass transfer into pulses. The mass loss gravitational dynamics from the source star could feed the source star's atmospheric oscillation. The atmospheric oscillation tides could be periodic or chaotic. Periodic in this case. An elliptical galaxy, also known as Centaurus A, located about 12 million light years away. Main image is about 58,000 light years across; Inset image is about 3,500 light years across.